One of Transform Rockford’s goals is to promote healthy lifestyles and create recreation assets that receive national acclaim. In fact, several of our favorite destinations have already received national attention. Here are 10 reasons we’re already excellent. One of Transform Rockford’s goals is to promote healthy lifestyles and create recreation assets that receive national acclaim. But for as much as we talk about creating excellence, we are in many ways already superior. Start with Rockford’s abundant park space. As the third-largest park system in Illinois, the Rockford Park District maintains nearly 5,000 acres – about 125 square miles – of neighborhood parks and top regional attractions. Last year, nearly 3.5 million people used these parks. Our region’s tourism assets help to attract some $330 million in annual local spending by visitors. In 2014, those out-of-towners filled 635,000 hotel rooms while enjoying assets like the Sportscore complexes, Rock Cut State Park, the BMO Harris Bank Center and Magic Waters Waterpark. It’s easy to take for granted our best qualities. Here are 10 reasons why the Rockford region is already a top place to play. Rockford Park District alone maintains five public golf courses, but only one can say it’s received national recognition for its quality and competitive layout. In 2014, Aldeen Golf Club added to its accolades when Golf Advisor ranked it No. 34 on its list of top U.S. courses. In 2009, Golf Digest called it Illinois’ best municipal course, and GOLF Magazine still names it a Thrifty Fifty. With a private club-style atmosphere, Aldeen complements the city’s other public courses, three 18-hole and one nine-hole, which together drew almost 200,000 golfers in 2013. Outside Rockford, Forest Preserves of Winnebago County maintains three courses, each with challenging layouts and mature trees.PrairieView Golf Club in Byron has received a four-star rating from Golf Digest. We sure know how to host a sports tourney. After all, we were once named a Sports Town USA by Sports Illustrated. Last year, some 300 events drew nearly 2.7 million athletes and fans to Sportscore I, Sportscore II, the Indoor Sports Center and other regional venues. Rockford has 13 booked major sports tournys for 2015, about 300 events total. Among them: The Ultimate Frisbee Invite has 150 teams competing, and America’s Team Championship table tennis tournament will attract players from more than 20 states. Rockford has both the Midwest Challenge Cup and the state middle and high school championships in rugby; the USSSA’s fastpitch softball 14-under Central Regional Championships; and the American Amateur Baseball Congress Willie Mays 10-under World Series. And a lacrosse championship, a darts tourney, soccer camps, and more. On a professional level, we’re also home of the Rockford Aviators, a Frontier League baseball team, and the Rockford IceHogs, an American Hockey League affiliate of the Chicago Blackhawks. In nearby DeKalb, the MAC-champion Northern Illinois University Huskies football team, with its recent bowl appearances, brings home the excitement of competitive college football. If sports tourneys are a big draw for out-of-towners, there are plenty of events that draw local crowds alongside tourists. Every October, the Head of the Rock Regatta draws rowing teams from across the country for a 5,000-meter race along the Rock River. Nearly 5,000 spectators line the shore from Whitman Street to Martin Park. This year marks the 30th annual State Street Mile, where racers join an all-out sprint downhill from SwedishAmerican Hospital to the Rock River. Every Friday night through summer, locals celebrate homemade food and drinks at City Market, and just after Thanksgiving, downtown’s streets welcome Christmas with Stroll on State. Downtown Beloit continues its 45-year tradition of its weekly farmers market, May-October, with more than 90 vendors sell their local and organic produce, and homemade goodies. It starts with top-rated museums like Discovery Center Museum and Burpee Museum of Natural History, and continues through the Nicholas Conservatory & Gardens, public biking trails and Magic Waters Waterpark. Then, there are tourism and history draws like Anderson Japanese Gardens, Klehm Arboretum and Midway Village Museum. Last year, the Sportscore complexes and Indoor Sports Center drew some 2.8 million visitors, many of them out-of-town competitors. The Indoor Sports Center also plays host to a variety of craft fairs and trade shows. The Rock River and many smaller area waterways are ideal for fishing, boating and kayaking, not to mention wildlife viewing. Both Sportscore facilities generate about $15.2 million for the region, and in order to stay competitive, they’re receiving big updates. An expanded indoor sports center and field improvements are expected to begin this year. A new indoor sports center in downtown Rockford, the $17.5 million renovation of a former Ingersoll plant, is expected to open in 2016. Part of the Reclaiming First initiative, it could add eight indoor courts for local teams and leagues, and attract new sports tourneys from out-of-town. Officials say it could generate $16.5 million over its first five years. For all the reasons there are to stay in Rockford, sometimes we need a vacation far away. Rockford makes it easy, with eight nonstop flights departing from the Chicago Rockford International Airport. Almost 20,000 passengers depart each month on flights from Allegiant Airlines and Apple Vacations, on their way to warm destinations that include Tampa Bay, Las Vegas, Orlando, Puerto Vallarta and Cancun, among others. With free parking and less traffic than Chicago, the airport is an easy alternative. If you’re traveling elsewhere in the world, Lindstrom Travel can help to get you there and back. The independent travel agency has helped travelers since 1928, and it sponsors many group travels to places such as Alaska and Ireland. It also helps travelers to find their way on business and personal travels anywhere around the globe. Take a quick drive outside of Rockford, and you’ll discover plenty of winding roads, charming small towns and fun-filled resorts that are ideal for a weekend getaway. Lake Geneva, Wis., is famous for its resorts and namesake lake, but that’s not all there is to do in town. The Grand Geneva Resort & Spa boasts two championship golf courses, while the Lake Geneva Cruise Line explores the lakefront’s beautiful mansions. Golfers will also enjoy the Geneva National Resort and its three signature courses, all beloved by PGA champions. In nearby Delavan, Wis., Lake Lawn Resort has been a popular destination for more than 130 years, due, in part, to its two-mile lakefront property. Travel west to the Driftless Area, with its rambling hills, Galena, Ill., and Dubuque, Iowa, are prominent attractions. These beautiful, historic downtowns are filled with unique shops, award-winning restaurants, relaxing resorts such as Eagle Ridge Resort & Spa, and quaint bed-and-breakfasts such as Goldmoor Inn. Further south, Savanna, Ill., offers outdoor recreation and family fun all year long. This old riverboat town along the Mississippi River is an endpoint to the Great River Trail, a converted rail path that leads to the Quad Cities. Savanna is also known for its motorcycles bars, especially the legendary Poopies. Farther up the Rock River, Dixon honors its place in history as President Ronald Reagan’s boyhood home. His childhood residence still stands, preserved as it was when he lived there, and his former school, now called the Northwest Territory Historic Center, commemorates this famous native son and the town’s other historic milestones. Our location just 90 miles away from both Chicago and Milwaukee makes it easy to travel into the city for business, a day trip or a night on the town. Downtown Chicago is a favorite destination, with its many museums, endless shopping and extensive lakefront, but a trip to its lively neighborhoods and suburbs provides an entirely different view. When it finally arrives, the anticipated Amtrak from Rockford will provide a direct line into the city. Closer to home, a perfect balance of city and rural life can be found in McHenry County, in cities like Crystal Lake and historic Woodstock. Surrounded by farmland, they offer top-notch shopping, theater and culture in a quaint, small-town atmosphere. In Milwaukee, the lively Third Ward lives up to the city’s reputation as the Beer Capital of the U.S., with numerous revitalized buildings housing trendy bars and restaurants. 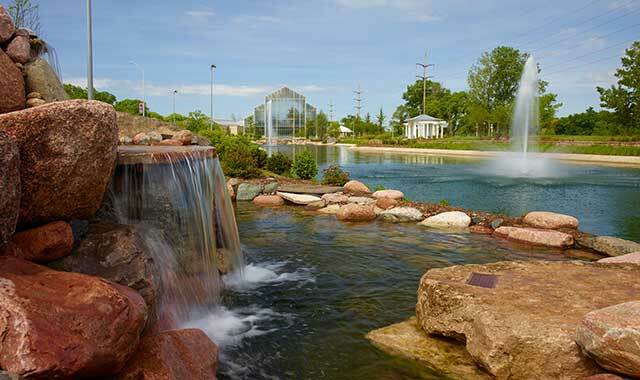 The city’s Potawatomi Hotel & Casino is an exciting place to stay and play, whether on the casino floor or at the hotel’s many entertainment venues. Our expansive natural landscapes and farmsteads are a relaxing retreat from the bustle of modern life, and within our region, many publicly owned state parks and natural preserves allow us an escape into the wilds. The Forest Preserves of Winnebago County manages 10,300 wild acres across 42 area parks, with a variety of ecosystems and countless wildlife to discover. The Byron Forest Preserve District, in Byron, encompasses some 2,000 acres near the Rock River, all set on rolling hills, forests and prairies. Its outstanding educational center and museum are located on the third highest point in Ogle County, overlooking 450 acres of restored prairie. The District also operates the 18-hole PrairieView Golf Course, a stargazing observatory and historic farm. Then, there’s Starved Rock State Park, in Utica, Ill., an amazing public preserve that has 18 canyons, amazing views of the Illinois River, and an abundance of wildlife. Stay overnight at the log cabin lodge to soak in a national park-like setting. Around our region, recreation & tourism attracts an estimated $330 million in visitor spending. The leisure and hospitality industry accounts for nearly 10 percent of all local jobs, according to federal data from the Bureau of Labor Statistics. In 2014, the Rockford Park District alone attracted more than 3.5 million users to its parks, while some 9.5 million people showed up to the district’s top 40 attractions. This entry was posted on Thursday, April 23rd, 2015 at 12:00 pm	and is filed under Annual Guide. You can follow any responses to this entry through the RSS 2.0 feed. Both comments and pings are currently closed.